The best thing you can do as a middle and high school student to prepare for a career is to take school seriously. Do your homework, pay attention in class, and study for tests. If you need a study buddy or help understanding a difficult concept, let our office or your TRiO Advisor know--we can find you the help you need. Some of you already know what you'd like to do after high school: be a welder or a doctor, a teacher or an accountant. Others have no idea--and that's okay! We are unified with the Humboldt County Office of Education to help you find something you LOVE, something you're GOOD AT, and something the WORLD NEEDS. 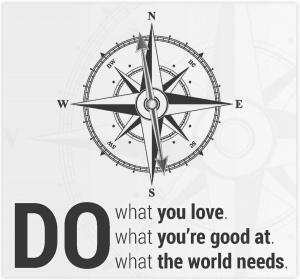 If you do these three things, you will find not only a career, but a vocation. Use the resources below to take career and personality assessments, learn about various fields, and explore career opportunities that could be the right fit for you. Humboldt County Office of Education provides a Navigator account to every student in grades 7-12. Navigator is a powerful tool for learning about yourself, exploring college and career options, and planning for your future. If you forgot your log-in information, your TRiO Talent Search Advisor can recover your account information for you. A simple, user-friendly format for self-assessment, job exploration, and understanding money and financial choices. Where careers, opportunities, and diversity connect. A wonderful resource for minorities and Persons of Color in the workforce. Find colleges, learn how to pay for your education, and make your plan. Hear stories from college students who weren't sure how they would pay for college, who changed their minds about what to study, and who missed home but ended up loving college.